Upgrade Your Bicycle – So, you’ve ‘gone green’ and decided to ride your bicycle instead of driving a car or taking public transport? Congrats, you’re doing your part to reduce carbon emissions! It can often be perceived that way, especially if you conjure up images of the city slicker with his safety helmet on weaving through the rush hour traffic. However, there are many fun things you can do with your bike and one of them is to spend time modifying and upgrading it. Newbie cyclists often overlook tires, but they can radically change the handling, feel, and performance of your bike. If you want to grip the road better and ride faster, you should definitely consider upgrading the stock tires. One increasingly popular innovation are tubeless tires, i.e. those that don’t need an inner tube and are more robust when it comes to punctures. Typically used on off-road mountain bikes, tubeless tires are now more accepted among road cyclists. They are a bit more of a hassle to install because you need to seal them around the wheel, but a cycle shop can easily do this for you for a small fee. When you spend some significant time cycling you will begin to realize the importance of a comfortable seat/saddle. While there is always a period of bruising that passes as your body toughens up, sometimes you just never get used to a seat and it’s time to upgrade. Of course, there are two routes to take when choosing the right saddle. If you’re an enthusiast then you might forgo some comfort for a light performance option, but if you’re simply cycling to work you might want to go for the biggest and softest seat you can find. Good brakes can mean the difference between a dangerous accident and a leisurely trip to work. While stock brakes will always meet a certain standard, they will deteriorate over time and there are always better options out there. A cost-effective upgrade is to replace the brake blocks (the part that clamps down on the wheel)—this is the part that wears down quickest in the braking system. Tip: If you’re looking to go all-out with your upgrades and don’t have the cash up front, you might consider finding a $1,000 loan online, so you can get it all done right away. There are many to choose from, with the best including dual compounds that work well in all weather conditions. Note: Brakes always take some time to get used to. If they’re sharper than before, you may be prone to braking too hard and being catapulted off your bike. Test them out near your home before hitting the open road. There are many different handlebar designs out there and the bar that came with your bike is not necessarily the best for you. Aftermarket performance bars are often made with carbon fiber because of its ability to be easily shaped. This has resulted in more comfortable shapes and lighter handlebars. Note: Handlebars are not one size fits all, so you will need to know your clamp diameter and handlebar width. A cycle shop can help you with this and let you test different types to see which is most comfortable for you. While there is an element of personalizing with all bike upgrades, you can definitely have a bit of fun by adding visual elements that have no performance benefit. We’re talking about flame decals and stickers, skull-shaped valve caps, handlebar tassels (ok maybe not those)—but, you get the idea. If you’ve ever wanted to see how far you can go with the visual mods, check out the low rider bicycle community that grew out of Mexico! You will get thirsty when cycling and it can be a hassle to pull a bottle out of your bag mid-journey. That’s why a simple flask holder and flask is such a popular and effective upgrade. They will also last years, meaning you aren’t harming the planet by constantly buying drinks in plastic bottles and throwing them away. While bottle holders are more practical, we still recommend pulling off and sitting stationery before taking a sip. A saddle-bag is a carefully designed bag that sits below your seat. You can store what you like in one, but they’re commonly used to hold tools and cycling essentials (puncture repair kit, wrenches etc). This means you don’t have to keep your essentials on your person and they don’t take up space in other bags. They also aren’t weighing your body down or getting in the way while cycling, which can be dangerous. There are many types of saddlebag, some which are quite heavy duty and secure, should you leave the bag there when you lock your bike up in public. The clanking of a loose chain can erode your frame over time. The frame can also be damaged quite easily if the chain falls off and gets stuck between the chain set and seat tube. There are many solutions to this, but the cheapest and simplest is to buy what is called a dog fang. It’s a small hook that sits around the frame and catches the chain in such a scenario. You can also wrap rubber or tape around your frame to prevent erosion from chain oil and dirt. You should never scrimp on a safety helmet and there is no scenario where you shouldn’t wear one. No matter how advanced bicycles become, the rider is still a sitting duck when it comes to road vehicles. You should take the time to find a light, high-performance helmet that fits you comfortably. They don’t have to be boring, however, as they can be found in many different styles. Just remember to never add your own stickers or decals as these can weaken the helmet and cause them to fail during a collision. One problem with cycling is that it can be dirty and there’s nothing worse than getting to work and realizing your pants are covered in mud! A simple and common upgrade that can keep you clean is mud-guards that go over both front and back wheels. The idea is that they block any dirt that the tires fling upwards. 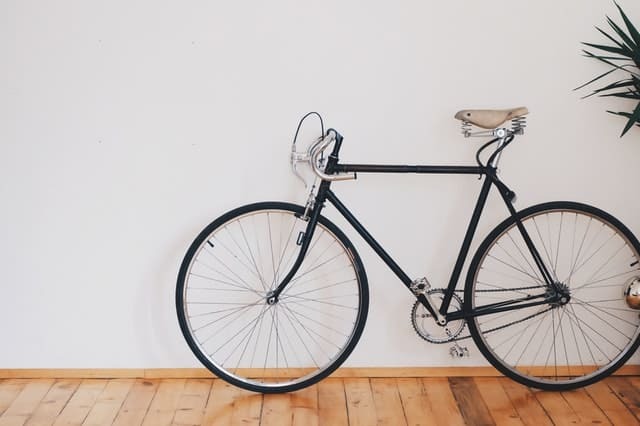 Are you an avid cyclist that has upgraded their bike? Let us know what you did and share any tips in the comments below!